Whether you’re looking for fields and trees, rocks and sea, a secret hideaway or a new place to explore, there are endless picturesque locations in and around Portishead. The views from Portishead seafront include the Welsh coastline and there is nowhere better than to take in these far-reaching views than Portishead Point, better known as Battery Point. Accessed from the steps that run alongside the open air pool and Lido Café (watch out for badger sett openings when you get to the top) or from the path leading from Eastwood. There are plenty of public seats here providing somewhere to stop and rest while admiring the views. There is also plenty of grass and open space to spread your blanket and enjoy a picnic while looking out over the water. The seafront Lake Grounds is ideal for family picnics with wide open spaces, extensive views and flowers and trees, not to mention a lake with boats, a children's play park and a café. At weekend you can watch a cricket match here, visit the tennis club or check out the bowling green. Just a stone's throw from the Lake Grounds, at the end of Beach Road West, take the track to a designated picnic area which is Kilkenny Fields. From here you can access the coastal path, wander to the Windmill Inn or just laze in the sunshine and enjoy your picnic. Merlin Park offers vast open green space edged by woodland. Enjoy views over the Gordano Valley, a walk in the woods or let the kids enjoy the play park which includes a zip wire. There is also a small skate park here. From the path in the wooded area behind The Royal Inn, stone steps lead to the shingled cove with fantastic views across the Channel to Wales. There are rocks to climb and pebbles to skim in between bites from your picnic hamper and if you time it right you can even watch the lifeboat training from here. Access via Fennel Road/Robin Place/Wren Gardens or Sheepway. This offers great family walks and is a favourite for little ones trying out their first scooter or bike. From the bird hides, the wading birds and wildfowl are the easiest wildlife to spot, but other birds include skylarks and barn owls. The reserve offers great blackberry picking in season too. The reserve is managed by North Somerset Council, supported by the Friends of Portbury Wharf Nature Reserve. There's lots more information, including a beautiful hand-drawn map, on their website. Pony picnics at Sperrings Farm in Clapton in Gordano provide farmland surrounded by great countryside where you can enjoy your picnic and then get up close with some animals. Sally and Bex, a mother and daughter team who live on the farm, are keen to encourage youngsters to take an interest in equestrian activities and so invite families to enjoy a picnic (pre-booked) on their land and follow it with a visit to the Shetland ponies or a horse riding lesson. Visit Sperrings Equestrian website or here for pony parties and riding lessons. Another secluded cove and shingled beach ideal for picnics is Sugar Loaf Beach. This can be accessed via a lovely coastal path walk from the Beach Road West car park or field alongside the Windmill Inn. Alternatively you can access it from Belton Road by Portishead Yacht and Sailing Club. There is an old tidal pool on the shingled beach, which underwent some refurbishment by volunteers a few years ago and you will also find Black Nore Lighthouse here, which hosts regular open days during summer months. Large rocks or a stepped platform provide the ideal place to spread your picnic blanket. Known to locals as the ‘Rose Garden’, this neat garden area lies on the corner of Beach Road West and Rodmoor Road. 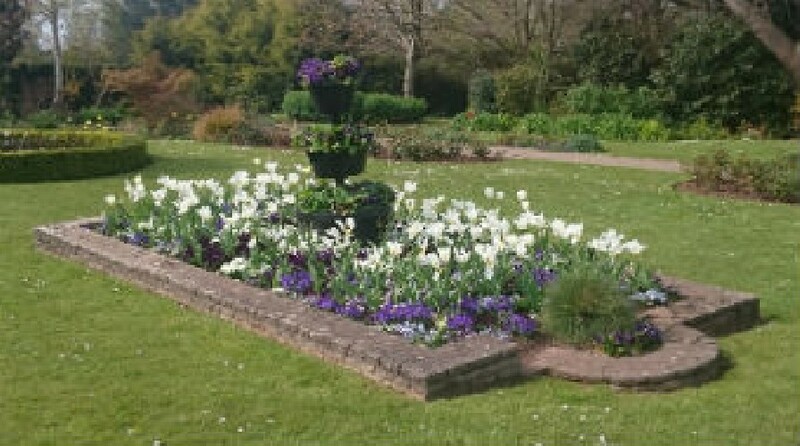 Complete with lovingly tended flowerbeds and public benches, it offers an ideal spot from which to rest and look out over the Lake Grounds, seafront and Bristol Channel. The woods are a fantastic place to meet friends for a picnic, before seeing what animals you can spot among the trees. Weston Big Wood is one of the most wildlife-rich woodlands in the area. In springtime the ground is covered with wood anemones, violets and masses of bluebells. The wood is very good for birds, including woodpecker, nuthatch and tawny owl and you will also find deer, foxes and rabbits. Nature lovers can spend the day hunting for the resident wildlife and mini beasts. There are also special sculpted waymarks installed around the wood. Weston Big Wood is managed by the Avon Wildlife Trust, and you can find more about it on their website.